Bankrolling the region’s biggest humanitarian disaster won’t win Beijing many friends. China’s commercial forays into Latin America are billed as a win-win: Latin America needs investment and China has money. Yet its biggest investment to date has helped to underwrite Latin America’s most serious humanitarian disaster. This undeniable reality presents an important lesson for Latin American nations: Unless the terms are changed, some money is too expensive. China’s track record also means that as the region struggles to contain the fallout from Venezuela, the Asian giant needs to be part of the solution. The Venezuelan tragedy is hard to overstate. Its economic collapse, seven-digit inflation, and the disintegration of even its most basic infrastructure have made life desperate for its citizens. Well over 2 million have fled in recent years, and the United Nations Refugee Agency (UNHCR) expects another nearly 2 million more in the coming year. China’s biggest investment in the region by far has been Venezuela. Over the last decade it has poured in more than $60 billion dollars, half of all Chinese capital destined for Latin America. In return, it has been promised one million barrels of oil per day (only a portion of which has been regularly delivered). As the South American nation turned increasingly authoritarian and kleptocratic, China kept lending. When international markets closed to the pariah nation, China rolled over debt and even offered new financing (in return for discounted assets), helping to keep aloft the regime of President Nicolas Maduro. In 2017, Goldman Sachs was pilloried for circuitously buying almost $3 billion in “hunger bonds” from the Venezuelan government. 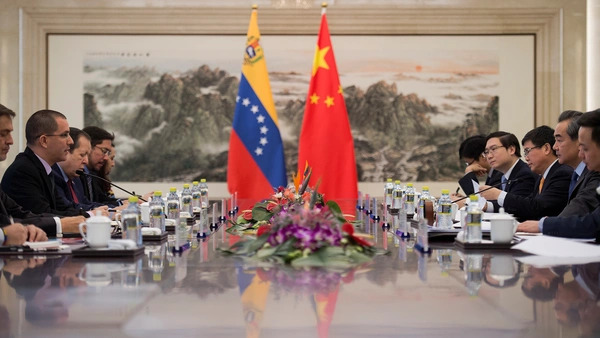 Yet China’s larger and more direct influxes into Venezuela's treasury -- including a $5 billion credit line extended in September -- have been met largely with silence, including by Latin American governments. This is driven in part by Latin America’s need for infrastructure investment. With more than 60 percent of its roads unpaved, two-thirds of sewage untreated, and so many of its electricity grids, rail lines and ports decrepit, the region lags OECD nations, the Middle East and North Africa in World Bank rankings. And the gap is widening: Latin American nations spend less than half their East Asia peers do as a percentage of gross domestic product. With logistics costing up to double what they do in OECD countries, McKinsey & Co. estimates Latin American nations need to spend some $7 trillion in the next decade just to keep up. China has expanded its financial footprint in the region, investments rising over tenfold to some $25 billion in 2017. The Belt and Road initiative, a trillion-dollar investment fund, holds the potential for tens of billions more. And the region has enticed many state-owned enterprises searching for places to put their money, people and raw materials to work. China’s main electric company has gone big into Brazil. Its biggest construction company is working on a $2 billion dollar highway from Buenos Aires to La Pampa, and China’s Export-Import Bank is funding Latin America’s largest solar park. In other parts of the world, multilateral institutions, civil society groups, and academics have cautioned against relying too much on China’s largesse. Critics point to limited transparency, lax environmental and human rights standards and the crowding out of local production and jobs by an influx of Chinese materials, equipment, and workers. Some have begun to worry about losing control of the infrastructure projects themselves, as has already happened in Sri Lanka and Djibouti. But this pushback has remained mostly outside official channels. With the catastrophe unfolding in Venezuela, Latin American governments can no longer give China a pass. Instead, they should use the deepening humanitarian crisis as an entree to press the Chinese government to change its lending ways. To be effective they need to do it together, offering the carrot of expanded regional economic opportunities even as they carry the stick of closing off access to the region’s economies and natural resource bounty (as Malaysia’s Prime Minister Mahathir Mohamad recently did, cancelling two contracts). China has shown that its commercial terms are renegotiable: When President Mauricio Macri took office, for instance, he successfully revised the particulars of nuclear investments in Argentina’s favor. It is time now for Latin America to make a much bigger ask of its courted funder, to bolster rather than undermine the democratic politics the region has pledged to uphold and to support the millions of Venezuelans driven from their homes. The region's commodities and markets give it some leverage. For even as Venezuela's problems can't be solved without China, China's own economic future will benefit from nurturing constructive ties with Latin America.